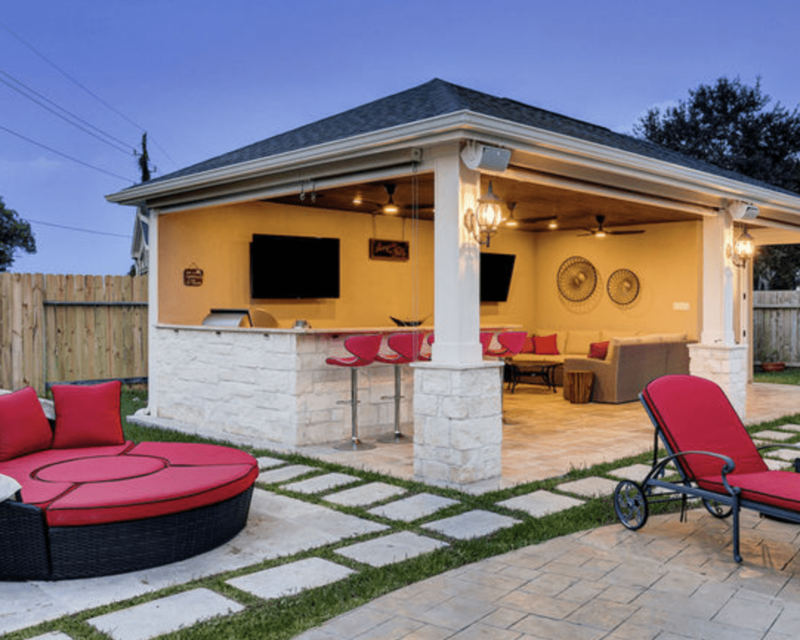 January 2019 – Texas Custom Patios has won “Best Of Design, Customer Service, Design Photography” on Houzz®, the leading platform for home renovation and design. The turnkey custom design project builder was chosen by the more than 40 million monthly unique users that comprise the Houzz community from among more than 2.1 million active home building, remodeling and design industry professionals. 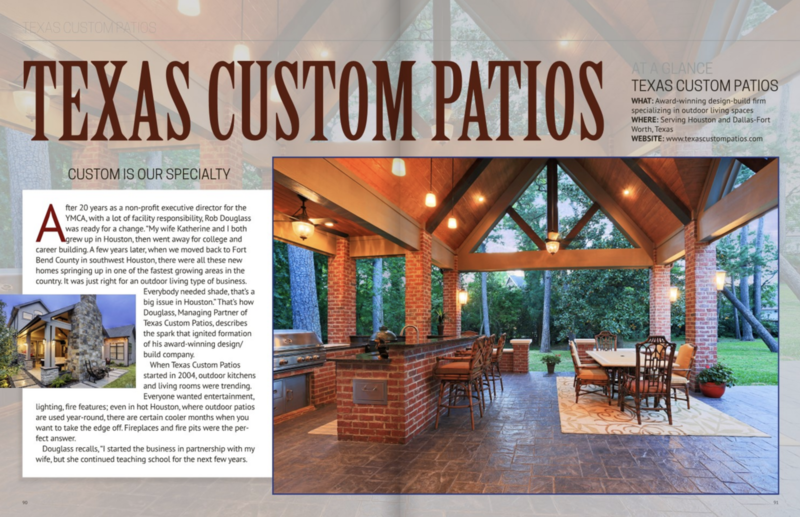 This is the 4th year in a row for Texas Custom Patios to score this coveted title! To follow us on Houzz, read our reviews, or check out our award-winning projects, visit here! Click the image below to discover details of this transitional covered patio in Katy, Texas. Named “Cool Cabana” by Hearth & Home for August, this project in Houston is simply stunning. This covered patio project was completed earlier this year and is not only attracting new neighbor friends for this homeowner, but it’s catching the eye of many. This was also our featured Project of the Month for May of this year, to explore all the details, visit here. For more cabana-esque projects, stroll through our gallery for freestanding patio covers. On many occasions, some home owners see their breezeway as something that complicates a potential project. Others just may not understand what can be done with a breezeway at all. Some even decide to not pursue a potential patio addition because of this confusion, which is a big mistake! Typically the breezeway connects the house to the garage to protect you from the elements while walking between the two. Sometimes the breezeway will have your electrical wires running through it, as the breaker box is in the garage. This is very common and not anything to be concerned about. The breezeway is typically built to hold only the weight of the breezeway with absolutely zero additional weight. When Texas Custom Patios comes out for a site visit, we will look at your breezeway and discuss the options available to you. On average, it’s best to remove the breezeway and run the electrical in the attic space of the new patio cover. Sometimes we will cut off the existing breezeway and re-attach the remaining breezeway to the new porch, or we build a totally new breezeway if that makes most sense. Many times homeowners convince themselves this cannot be done, but it’s really not a big deal. On rare occasions the electrical wires can create a challenge, but your project developer will discuss options to work around this. Our expertise allows us to create a clean, well-thought-out look that even the builder of your home would have done had they built the cover themselves. We have found removing the breezeway, when possible, is a best practice in our industry. Don’t let your breezeway keep you from exploring a project … trust us, it’s a breeze! To explore a variety of options to consider when building your patio, click here!